Without warning, car accidents can leave people in the Miami area, as well as in other areas throughout the State of Florida, struggling with severe injuries. 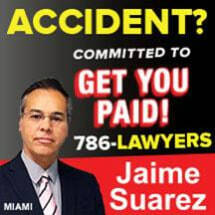 The Law Offices of Suarez & Montero provides dedicated personal injury lawyers who are committed to helping the injured due to the negligence or carelessness of others to achieve the financial justice and protection that they deserve. Beginning with a free initial consultation, attorneys Jaime Suarez and Andres Montero thoroughly ask the pertinent questions needed in order to determine how each of their clients' lives have been affected by the negligence of others. Each case is critically analyzed in order to provide the customized advice based on each client's specific needs and goals. Mr. Suarez and Mr. Montero's experience covers assisting clients with a range of complex matters, including those involving car and truck accidents, slips-and-falls and premises liability. Following an accident, many people rely on insurance companies to make them whole again. Having more than 40 years of combined legal experience, Mr. Suarez and Mr. Montero have seen the lengths that these companies may go to avoid paying for their clients' negligence. Aggressively advocating on behalf of their clients, they strive to help those they represent to recover appropriate compensation for their losses. This includes associated medical bills, lost income, and pain and suffering. In addition to helping accident victims recover the maximum compensation for their injuries, the Law Offices of Suarez & Montero provides criminal defense services. Offering the same level of compassionate guidance as they give those who have been injured through no fault of their own, they assist people to achieve the best possible outcomes to cases involving issues such as traffic violations, DUI, and other misdemeanor and felony offenses.